I had to rewind it because I couldn't believe what I had heard. It’s too bad that Jamal Simmons was the only person who reacted to her comment (although I commend his handling of the situation). Such blatant racism should offend everyone, not just the black guy in the room. The RNC should renounce and reject her statements. I live in England. I turned on 'Larry King Live' this morning and almost choked on my cornflakes when I heard the disgusting comments made by Kellyanne Conway. Is that the voice of the Republican Party? If so the USA can keep John McCain. Europe loves Obama and we want Obama to be the next President of the USA. 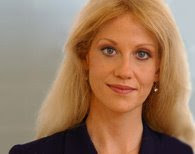 Kellyanne Conway represents all that is wrong with the Republican Party. She should never appear on Larry King Live again. Conway should apologise to the world for the offence she has caused. Her comments were ugly - very ugly. I watched it with disbelief. But then I realized, she wants to get Obama and his followers enraged (rightfully), so much so that if Hillary won, Barack would see VP as 'back of the bus' and refuse it as an insult. The duo-ticket would overwhelm the Republican votes, and she knows it.